Praise affects you, it affects the devil, and it affects God. It touches everything and every part of your life. Likewise, a lack of praise affects you in a negative way, turns the devil loose in your life, and doesn't bless God. You have to get this area of your life right. These disciples were about to see Jesus arrested and then flee in fear for their lives. They would see Jesus unjustly condemned and then crucified and buried. And He was telling them not to let their hearts be troubled! To the average person, that's unreasonable. At the time Jesus said that, He hadn't been crucified, much less resurrected and seated at the Father's right hand. It was because of faith that the disciples were supposed to rejoice. He had promised that He would be resurrected and then reign, and if they were in faith, they would rejoice--and so would we. We live in a negative world, a fallen world where it seems that the ungodly are getting more and more prominent. So much of what we hear is just negative, and we have to make a deliberate effort to be positive and counter the culture we live in. Praise is a great tool to help us achieve that. We may not feel joyful, but Scripture tells us in Galatians 5:22 that the fruit of the Spirit is joy. If we have the Holy Spirit, we have joy. We may not feel that joy, but we can choose to lift our hands and speak forth praise to God by faith. Learning to praise God even when everything is going badly will change our hearts, make us much more effective, and cause our faith to abound. I truly believe that my choice to praise God, even after getting the report that my son was dead, was one of the biggest factors in seeing him raised from the dead after nearly five hours. I didn't know what the outcome would be, but I started praising God with all of my heart and telling Him--and the devil--that regardless, I would not quit serving Him. It was at that moment that faith abounded in my heart, and I knew he would be raised from the dead. Thank You, Jesus! We have to accept responsibility. We aren't just elevated animals, responding to stimuli. We are created in the image of God. We can choose to say that we are going to give thanks and rejoice in the Lord. But until we do, we are victims. We will never be victors until we quit being victims. We have to get rid of the excuses and just do what the Word of God says. Do you know what the Greek word for "nothing" in that verse means? It means nothing! It means there are no exceptions. Sure, you might have problems, but you don't have to worry about them. You don't have to be careful about them. You can go to the Lord in prayer with thanksgiving and make your requests known to Him. Jesus demonstrated the right way to bring our requests to God. He used what I call the "sandwich technique," where we sandwich our requests in between two slices of praise. We start with praise, and we end with praise. We can just look at how Jesus did it in the Lord's Prayer (Matt. 6:9-13). He started by praising God: "Our Father which art in heaven, Hallowed be thy name." And He finished by praising God: "For thine is the kingdom, and the power, and the glory, for ever." That's the way to do it. Even in the Old Testament, believers were told to "Enter into his gates with thanksgiving, and into his courts with praise: be thankful unto him, and bless his name" (Ps. 100:4). But the nation of Israel didn't always do this. In fact, the Lord said that because they did not serve the Lord with joyfulness and gladness for the abundance of all things, He was going to bring judgment upon them (Deut. 28:47-57). This shows that God holds us responsible for rejoicing, praising Him, and being thankful for all the good things He's given us. We face a lot of tough circumstances in this life, and the world expects us to behave a certain way when problems come. But God told us to respond a different way--to not let our hearts be troubled. We get to choose (Deut. 30:19). We have the option of following Jesus' words and acting on the Word of God. Praise is not the inevitable byproduct that comes when everything is going right in our lives; it is the driving force. Praise will get our focus where it needs to be--on God. If we start praising God in the middle of our problems, our problems will shrink so much that we'll hardly remember to bring them to God! We'll be so busy praising Him and thanking Him for His blessings that our problems will be an afterthought. I have so much more that I want to share with you on this often overlooked subject, I've barely scratched the surface. Praise is also a very powerful weapon against the devil, and most importantly, praise and thanksgiving blesses God. Most people have never thought about how our praise affects God. You need to get a hold of this. 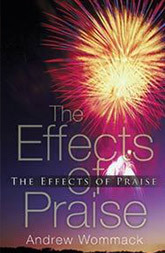 You can get my complete The Effects of Praise teaching as a CD series and as a paperback book. It will also be available as a DVD series later this month. This is an aspect of the Christian life that I think all believers need to dig deeper into. I wish I could share just exactly how this impacts you, God, and the devil, but I don't have the room. Get this teaching--you won't regret it! P.S. Speaking of praise, Jamie and I constantly praise God for all of you who have enabled us to fulfill God's call on our lives. We couldn't do it without you. You are a vital part of every single life that is touched. Thank you from the bottom of our hearts. Great is your reward. THE BEST IS YET TO COME!